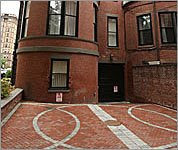 Back Bay Parking Space sets a new record selling for $300,000! A new record was set yesterday when a buyer purchased a parking space located behind 48 Commonwealth Ave for $300,000. Yes, that's with 5 zeros! This topped the previous record set in 2006 when a parking space sold for $250,000 behind 31-33 Commonwealth Ave. To put this into perspective, if the buyer financed the purchase at current rates and put 20% down, the monthly mortgage payment would be $1,362.69! I'm pretty sure they paid cash, but it's still seems crazy. I guess $20 for valet parking isn't such a bad deal. Last updated April 25 at 11:51 am.